Solid storytelling, a longtime strength of the best Pixar pictures, elevates “Cars 3” into the pantheon with the studio’s finest. Rating: 3.5 stars out of 4. Usually by the time a movie franchise hits its third installment, the whole enterprise has run out of gas creatively. Too often, the spark and originality that made the first picture a hit have been drained away, and the follow-ups are vehicles whose sole goal is to grab as much cash as possible by exploiting the goodwill generated by the movie that launched the franchise. Pixar’s “Toy Story 3” is generally acknowledged to be the strongest and most emotionally resonant entry in that series. 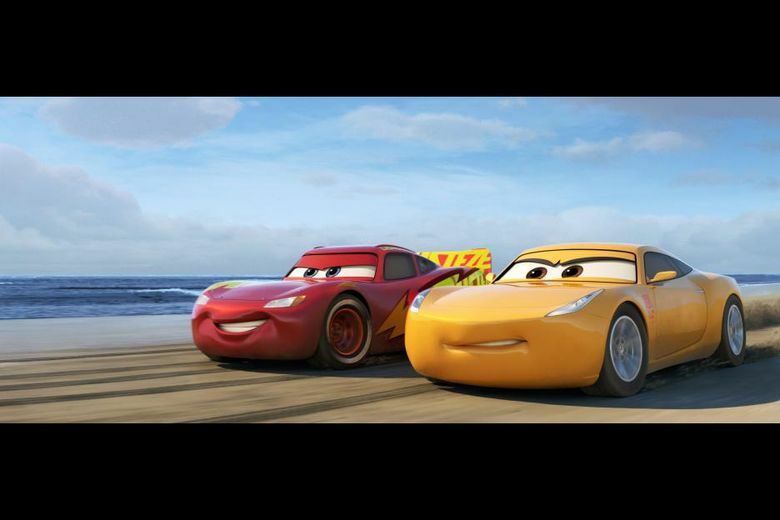 And now, with “Cars 3,” Pixar has done it again. ‘Cars 3,’ with the voices of Owen Wilson, Cristela Alonzo, Armie Hammer, Nathan Fillion, Larry the Cable Guy. Directed by Brian Fee, from a screenplay by Kiel Murray, Bob Peterson and Mike Rich. 100 minutes. Rated G; suitable for all ages. Several theaters. In a way, that’s an even more impressive achievement, because the first “Cars” is not regarded as a first-tier offering from the animation behemoth. Unlike, say, “Up” or “WALL-E,” “Cars” is more overtly kiddie friendly and less substantial in terms of its storytelling. “Cars 3,” by contrast, is heartfelt and thoughtful. A key element of the first “Cars” is the steadying mentoring of its hotshot hero racer Lightning McQueen (voiced by Owen Wilson) by wise old Doc Hudson (the late Paul Newman). Though Doc is departed, he’s nevertheless prominently featured in “Cars 3,” as Lightning finds himself in a situation similar to Doc’s at the end of the older car’s illustrious career: being bypassed by younger, faster rivals, particularly a high-tech speedster named Jackson Storm (Armie Hammer), a sleek blue-black number that looks like the Batmobile. He reflects on Doc’s fate and is inspired by his advice to learn how to race smarter to outwit and outrun those rivals. Thus does the movie pay respectful homage to Newman. At first blithely condescending toward Lightning, she later reveals she idolized him as a kid and wanted to emulate him on the racetrack. In one of the movie’s most moving scenes, she relates how her dream of being a racer was squashed by the male-centric culture of the pro-racing circuit. In this manner does the movie ding the NASCAR boys-club mentality. A later scene involving a retired female racer who was also marginalized emphasizes the point. The picture ends with an act of astonishing generosity by Lightning and wraps up on a high note of joyous positivity. Solid storytelling, a longtime strength of the best Pixar pictures, elevates “Cars 3” into the pantheon with the studio’s finest.